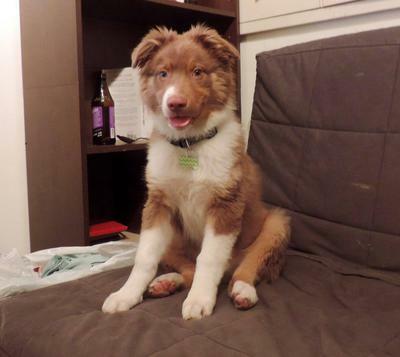 Hi folks, I'm a proud owner of a 5 month old Red Tri Aussie. His name's Spud. He's such a wonderful lil' trooper. Playful. Intelligent. Social. Eager to please. Extremely well-behaved. And the cutest little pup ya ever saw (I am, of course, very biased). My only issue is that, during walks, when he encounters other dogs, he naturally gets tremendously excited and usually begins frantically barking. It's not an aggressive bark. He simply wants to play. Generally speaking, however, he temporarily abandons his impulse control during these transactions, which I view as problematic and in need of remedy. I've tried, upon seeing another dog and owner trundling toward us during a walk, having Spud sit and wait. If he maintains his composure as the dog walks by, I generally have rewarded him with a tasty treat and excessive praise. I've had mixed results with this tactic. Does anyone here have any suggestions, aside from the strategy I'm currently using, for improving my pup's outdoor on-leash decorum? I'd greatly appreciate it. I have an 11 mo. Aussie and try putting treat in closed fist and let your dog smell it as you pass by the other dogs. Once the puppy has quietly passed the other dogs, give the treat. Works great with my dog. Good Luck. Congratulations, Spud looks like a great pup! Aussies have so much playful enthusiasm, I find it takes them a while to mature and settle down. Spud is still very young, but you are doing exactly the right thing to make him sit quietly while others pass by. He will get it eventually, it takes patience and a long view. My boy at 11 months can now, and I have trained a lot with him. Hi! Our Aussie was doing the exact same thing. She would even stand at the end of the leash barking. I knew she just wanted to play but I don't think owners were taking it like that not to mention that it gets the other dog worked up and that's not fair to others trying to have a nice relaxing walk. I ended up bringing in a private trainer who taught us "look". During walks we would use look with treats. It puts your dog's attention on you and not the other dog. We would stop "look" after the dog passed. It didn't take long before we could go on walks and not even have to use the command. She would actually turn to look at me when she sees a dog approaching looking for her treat! Good luck!